Dietmar Reindl, COO of IMMOFINANZ, gives an interview regarding the road to becoming Europe's leading retail park operator and the challenge of online retailing”. ACROSS: IMMOFINANZ is forging ahead with the expansion of its STOP SHOP retail park brand and has acquired an additional eight specialty shopping centers in recent weeks. Can you give us a brief overview of the details surrounding this acquisition? Dietmar Reindl: Certainly. In the last two years, our STOP SHOP portfolio has considerably grown from 58 to 80 locations. The recently acquired retail parks are located in Serbia (3), Slovenia (3), and Croatia (2), are fully leased, and generate annual rental incomes amounting to approximately EUR 7.2 million, which corresponds to a gross yield of 8.0%. ACROSS: What other factors lend themselves to these purchases? Reindl: These acquisitions strengthen our position as Europe’s leading retail park operator. These attractive investment opportunities are distinguished by their good locations, the track records of all locations, the favorable competitive conditions at each site, and the classic, good tenant mix. In addition, the achievable returns in these markets speak for themselves. ACROSS: What is the purchase price and how will it be financed? Reindl: The total purchase price amounts to approximately EUR 90.5 million and will be financed using the Group’s liquid funds. ACROSS: Croatia marks your entry into a new STOP SHOP market; you are already represented in Slovenia and Serbia. Are there any other new markets that you can imagine exploring? Reindl: That is correct. Croatia represents our entry into a new and very attractive retail market in the EU for our international retail tenants. The purchases in Serbia involve retail parks offering leasable space of roughly 32,500 sq m in the cities of Subotica, Borca, and Smederevo. 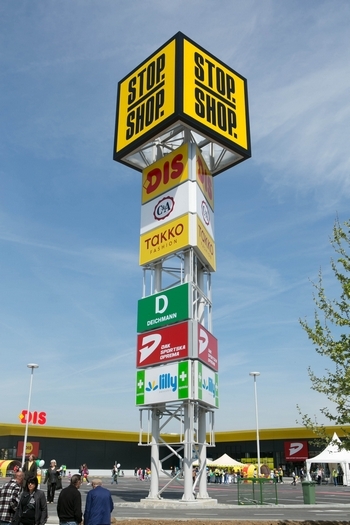 In that country, the STOP SHOP brand has grown to nine locations, accounting for 83,600 sq m of leasable space. The property package in Slovenia comprises three retail parks in the cities of Maribor, Krsko, and Ptuj and cover a leasable area of around 22,000 sq m. IMMOFINANZ’s Slovenian specialist store portfolio will, consequently, increase to nine locations covering 52,300 sq m of leasable space. And, yes: We can also imagine additional new markets in Europe for our STOP SHOP segment. Decentralized orientation and free market capacities are important for us. That’s why Germany, for example, is not on our STOP SHOP expansion list, but other EU countries are. ACROSS: Does that mean that the goal of approximately 100 STOP SHOPs will soon be reached? Reindl: Depending on acquisition speed and opportunities, that goal will presumably be reached in 2019/2020. Additional acquisitions are under consideration, and two STOP SHOPs in Poland and Serbia are currently under active project development, with more to follow. ACROSS: What roles do the effects of online commerce play in your strategy? Isn’t the expansion of retail space the wrong path to follow in the current digital age? Reindl: No, not with respect to our retail products. We have been intensively involved with online retailing for years and have taken account of developments in our brand strategy and portfolio structuring. This is precisely why we are currently concentrating our retail properties in decentralized locations in Central and Eastern Europe. We are, therefore, present in regions where the density of shopping centers is significantly lower than in Western Europe, where smartphone offers are limited, and where payment by credit card often represents an obstacle. As a result, we have even benefited from the effects of online trading. ACROSS: What exactly do you mean by that? Reindl: Consumers want faster availability of goods and have increasingly experienced this through online retailing. This is precisely the strength of our decentralized structure: fast accessibility, virtually, at every doorstep. The strength of our STOP SHOPs is certainly the convenience of shopping, whereby, on the one hand, we work on a constant increase in the quality of service and stay, but, on the other hand, we also consider the integration of click-and-collect store formats or pickup stations. In addition, one must also consider this: Specialty shopping centers are discounters. If our tenants sell a product for three euros in large quantities at our retail parks, they can earn good money. If, however, they have to pay one euro for logistics or transport, the deal is no longer good. ACROSS: talking about tenants: Are they supportive of your strategy and willing to expand with you? Reindl: That is exactly how it is. Our current tenant network comprises more than 100 and a wide range of different retailers. Polish fashion retailer LPP, for example, entered the Serbian market with us. All STOP SHOPs that we have opened in the last two years were fully leased from day one. There is no other company like IMMOFINANZ, with such a wide-ranging network of locations, a clear brand guidebook, and very fast, efficient expansion. These factors contribute to the further expansion of our leading market position.